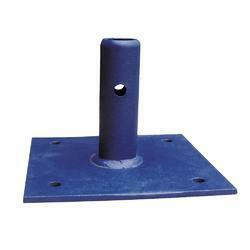 Manufacturer of a wide range of products which include scaffolding base plate. We are offering a remarkable gamut of Fixed Base Plate to our clients. Fabricated by making use of supreme quality required basic material these offered products hold several incomparable attributes such as longer service life, resistance against corrosion, sturdiness and high compressive strength. Furthermore, we have made the offered products available in different specifications so as to meet divergent demands of the clients. Our clients can avail the offered products in both customized and standard forms from us.